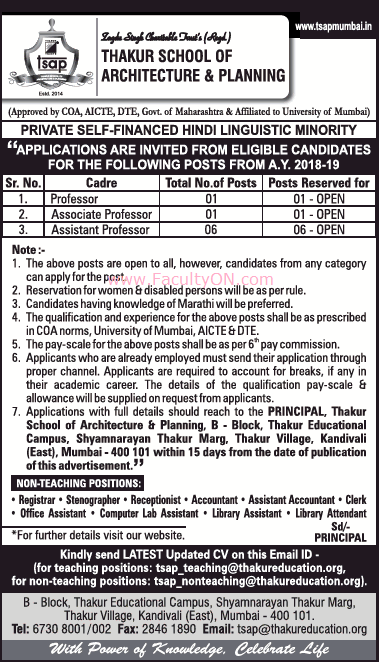 Thakur School of Architecture and Planning, Mumbai has advertised in THE TIMES OF INDIA newspaper for the recruitment of Teaching Faculty- Professor / Associate Professor / Assistant Professor Plus Non-Faculty jobs vacancies. Interested and eligible job aspirants are requested to apply within 15 days from 26th September 2018. Check out further more details below. About College: TSAP is guided by a strong vision and goal, that is oriented towards a purposeful mission, which will meet both the local and global requirements of Architecture by providing “State of Art, Architectural Education” to young budding aspirant architects that will be coherent with the overall sustainable developments of the state and country. Institute is an unaided and hindi linguistic minority institute.